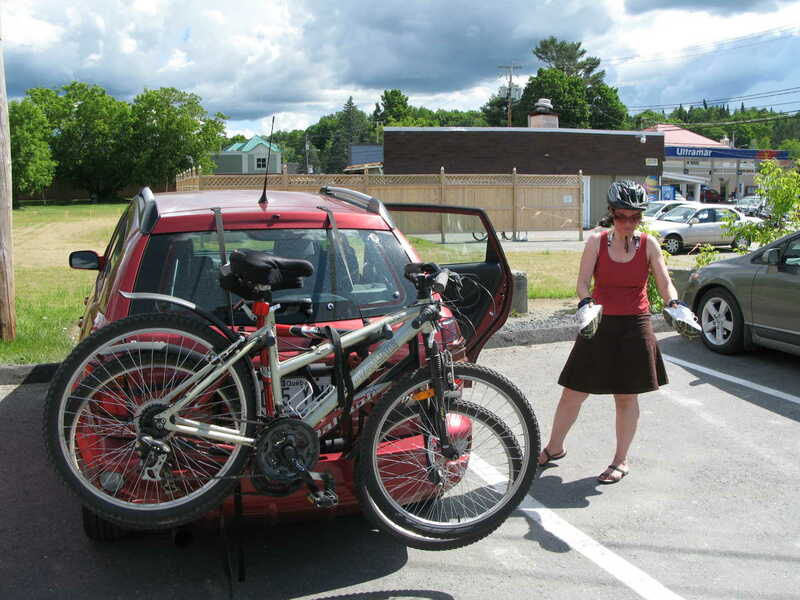 We drove down to Stanstead, QC to do the first section of the Tomifobia bike trail today…what the heck is Tomifobia…the fear of Tommy? The Tomifobia Nature Trail (TNT) is a 19-km rail-trail in the Tomifobia River Valley, between Rte. 141 in Ayers’s Cliff, Quebec and Rte. 247 in Beebe (Stanstead), Quebec. Sentiers Massawippi, a non-profit charitable organization, purchased this property in 1993 from Canadian Pacific. 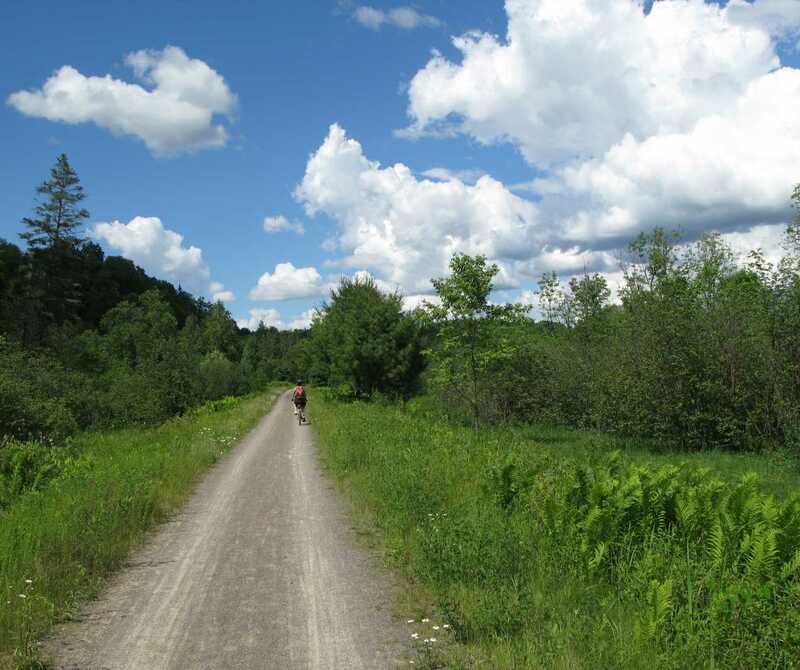 Commonly known as Sentiers Massawippi and running all the way to the U.S. border, the Tomifobia Nature Trail offers a ride through the heart of the Eastern Townships’ natural and architectural heritage. Running along a former rail bed, this trail offers cyclists a gentle excursion to Stanstead, where you’ll find the Colby-Curtis Museum, the Haskell Opera House and famous Canusa Street, with one side in Canada, the other in the United States. The week before we started the search for the perfect nature trail in Ayers Cliff where we did a half dozen km’s through the nature preserve…it was awesome! The first leg of the trip, from the information center to km 7 to be more specific, was lovely and flat and the sun shone as we drove along the Tomifobia river through forests and saw cows, ponds and flowers… it was so beautiful DD almost had a collision with another rider coming in the opposite direction. The second leg, from Stanstead to km 15 we had bike problems and I thought DD was going to rip a telephone pole in two pieces because her brakes jammed and the kick-stand was rubbing her tire! Next time we ride from Stanstead we will start at the head of the trail at km 19 instead of winding through town although we did get to see the locals and the houses for sale!I think I liked the first section best but all in all it is a real nice bike ride on unpaved hard packed trails…no worry about roller bladers or high speed racers here…it’s all about the beauty of nature! Next Next post: Brüno Movie, Starring Sacha Baron Cohen: Crazy! !